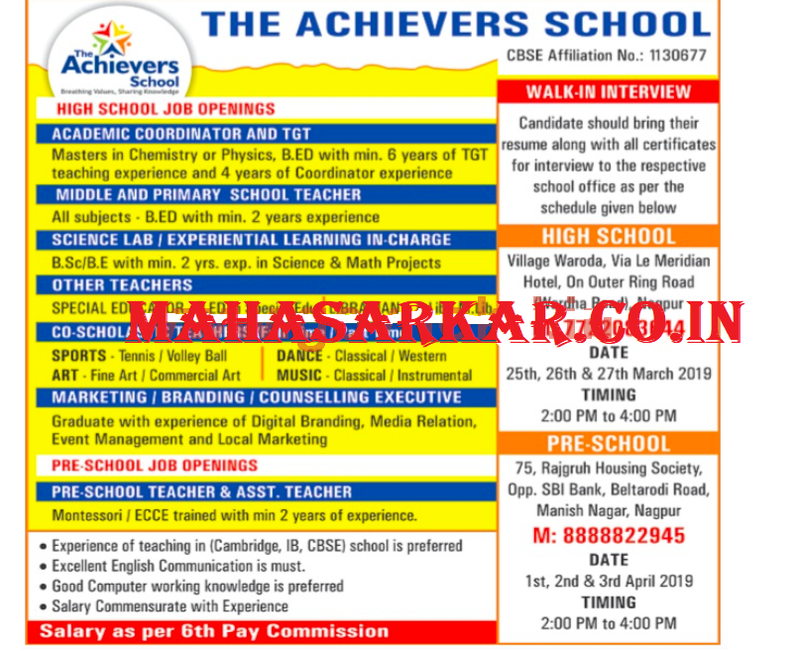 The Achievers School Nagpur (The Achievers School), Nagpur published a new job notification for Academic Coordination And TGT, Middle And Primary School Teacher, Science Lab Learning In-charge, Librarian, Marketing Executive, Co-scholastic Teacher, Primary School, and Assistant Teacher Posts. The willing candidates are informed to see the latest notification March 2019. Walk-in-Interview on 25th, 26th, 27th March 2019. For More details of The Achievers School Nagpur Recruitment 2019 Read Below. Academic Coordination And TGT Master in Chemistry, B.ED. Walk-in-Interview Date: 25th, 26th, 27th March 2019.